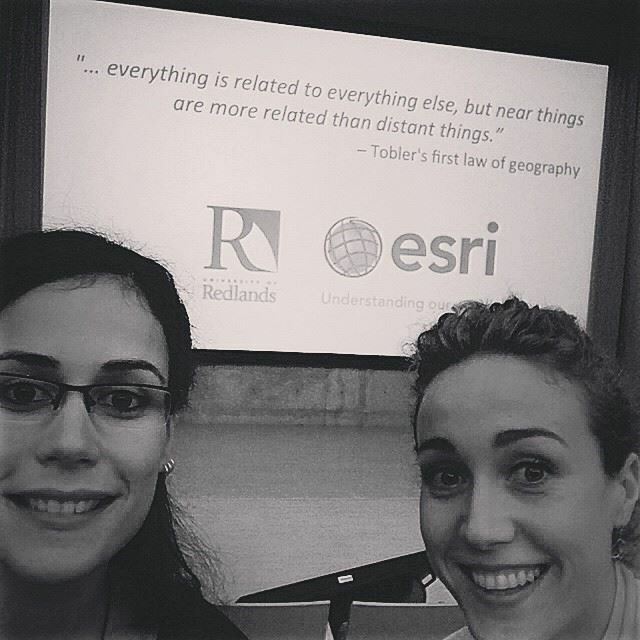 Women in GIS sat down with Flora Vale at the 2016 Esri User Conference to learn about her career as a Spatial Analysis Product Engineer at Esri. 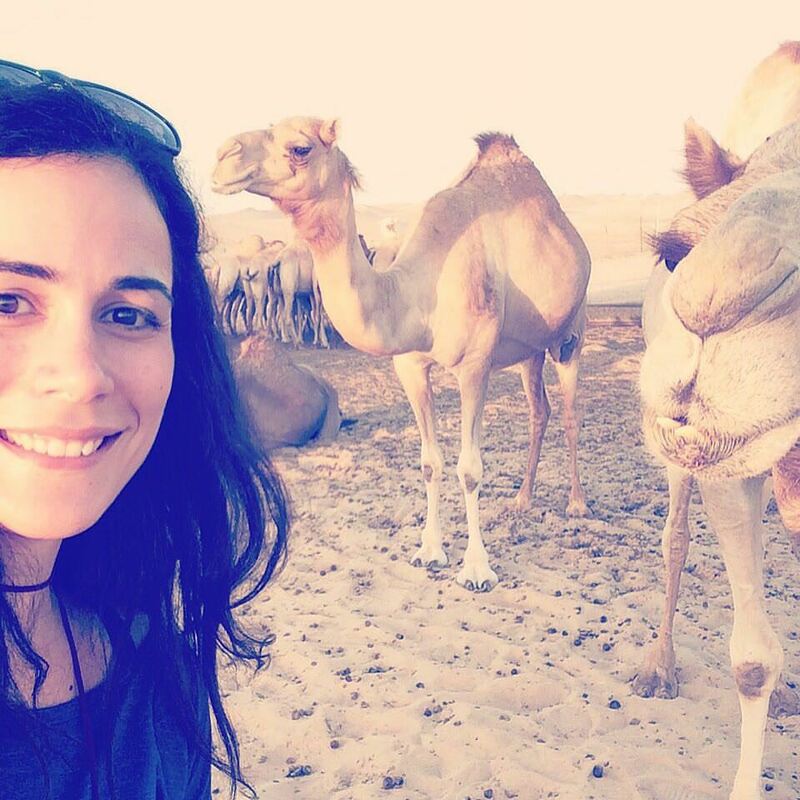 Vale attended the University of Maryland for her undergraduate education where she graduated with honors in Geography. She continued on to receive her professional masters in GIS from the University of Maryland. She was born in Brazil and moved to Washington D.C. at age 9. She currently lives in Silver Lake, California with her dog Chloe. Q: How did you first learn about GIS? A: I started undergrad as an Environmental Sciences major at the University of Maryland. I was kind of unhappy with the classes that I was taking and was feeling really lost. I went to my advisor and she suggested majoring in Geography. I didn’t know that you could do that! I took my first GIS class and at the beginning I was bored to death because we were just learning about datums and projections, it wasn’t much fun. Then I took a Cartography class and that’s when I really started to fall in love with GIS. I would stay in the lab all week making tweaks to my maps. To make beautiful maps, you need to have good data, an analysis question and a compelling story. That’s when things started to get interesting. Q: Can you tell me a bit about the start of your career? A: My first GIS job was with the Maryland State Government. I started in the Planning Department working on parcel data. I learned a lot, but it was mundane GIS grunt work. Then I moved into a GIS analyst position with Parks and Recreation which was exciting at first but I quickly outgrew it. I was hungry to learn more so I decided to get my professional masters. The program allowed me to both work and attend classes at the same time. When I finished, I decided that I wanted to work for Esri. 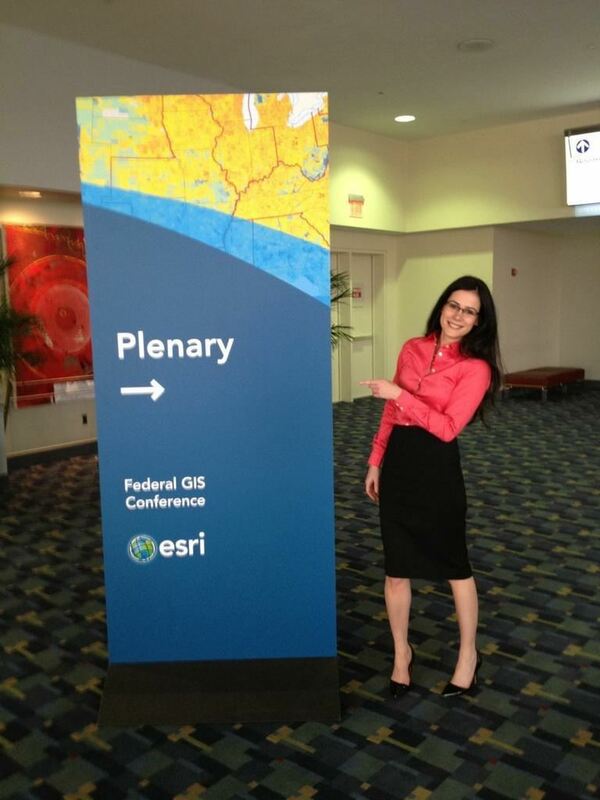 I attended a Federal GIS Conference in Washington D.C. and talked to everyone I could find wearing an “Esri” badge. I got some leads and eventually landed an interview. I started working on the Federal Health team analyzing data and helping different organizations understand their geographic information. This is when I became interested in the power of spatial statistics. Q: How did you get involved with the Spatial Statistics Team at Esri? A: I had taken a couple of classes on it in school but hadn’t really applied it in a real world setting. 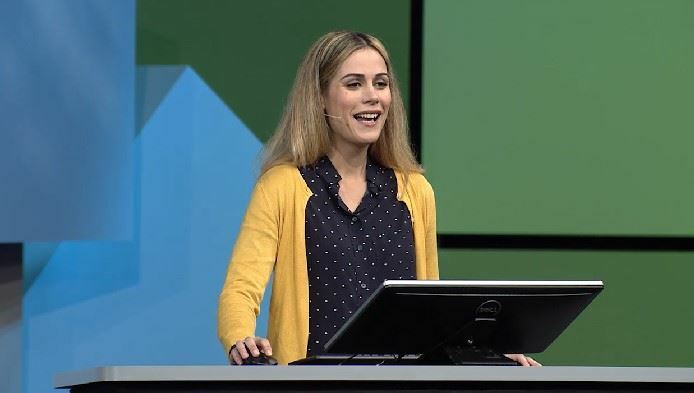 I started asking people I worked with where I could get more information about spatial analysis and I was told to speak with Lauren Bennett, one of the analysis experts at Esri. I reached out to her by e-mail and asked if she could point me in the right direction. She suggested I start by taking a look at Esri’s Spatial Statistics resources page. I went through every link, I read every word of every document, I watched every video and I did every tutorial. When I finally met her at a conference in Phoenix, I think she was impressed that I didn’t show up expecting her to teach me everything. We began working together and I was asked to teach some spatial statistics workshops. I went back and redesigned all of the workshop slides, so I had to learn everything inside out. Now I work closely with the Spatial Stats team to develop and design new tools and I continue to teach workshops and create lesson plans. Q: What gets you most excited about geography? A: I feel like it’s almost impossible to analyze anything without taking geography into consideration because everything changes over space and time. If you leave that out of the equation, then you will never get the whole picture. Learning about how the world works differently in different places is what attracted me to GIS in the first place. I feel like I not only understand Geography in a very technical way but also understand it in a very applicable way. It’s a tangible science and I really like that. I think that’s why I was really frustrated when I was studying Environmental Sciences and taking classes like Organic Chemistry, I found it to be too abstract. For me, GIS and spatial analysis is really all about solving real world problems and putting information into context. Q: What are some of the defining moments of your career? A: Well, the day that I walked into that conference with the intention of working for Esri changed everything. I had my mind set and I made it happen, that was a huge moment for me. Also meeting and working with Lauren Bennett really changed my path. I started with Esri as a Solutions Engineer in Washington D.C. and after a couple of years I was asked to come work for development out in Redlands. It was a big leap to leave my friends and family and drive across the country with my dog to California. I’m a city girl so moving to the suburbs for a while was definitely a change of pace. That was a big sacrifice that I had to make but it was a great career move. 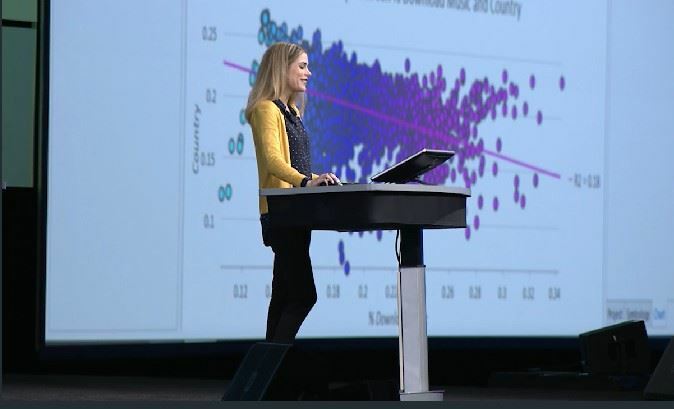 Also getting to speak at the Esri UC Plenary this year was a big deal. I don’t know if people realize from the outside, but that six-minute demo took hundreds of hours to prepare. It’s an insane amount of work but it’s also very inspiring to get to work with such an amazing team of incredibly talented people. Q: What is your favorite part about working for Esri? A: I’m surrounded by super brilliant people. If I have a question about anything, I have access to the people who built the methods and software. I can learn so much from everyone all the time. I would say I learned most of my GIS after college. Once you start applying things, it’s a different story than the hypothetical academic environment. I also love that Esri encourages us to pursue what we’re good at. Teaching Spatial Stats was never part of my job description, but I love it and I’m good at it, so I was able to incorporate it into my role. 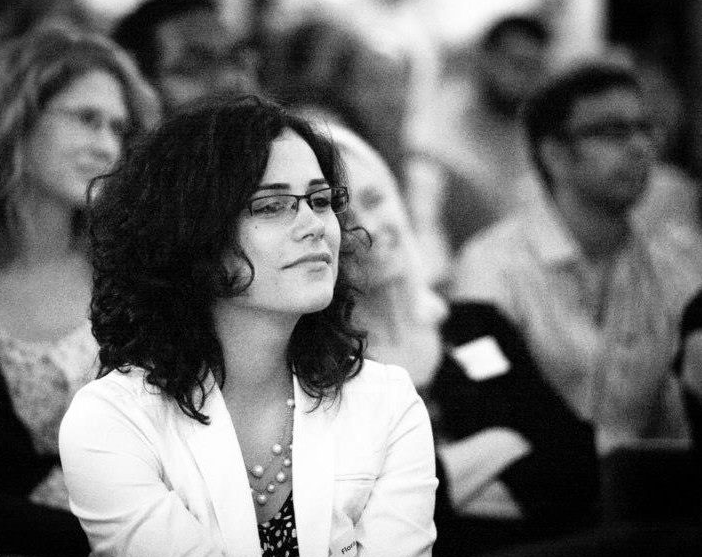 Q: What are some of the challenges you have faced with being a women in tech? A: Begin a woman in tech can be a little bit tricky. We’re outnumbered and it’s sort of like you have to be a badass or else you can’t play. That’s fine because I have every intention of being excellent, but it sometimes feels like men can be any level from satisfactory to brilliant while women really all have to be amazing. When I meet people out in the world and they ask me what I do, I tell them that I work in software development. They say “oh, you must be smart then”. I doubt anyone would say that if I were a man. I always just say back, “yes, I am smart. Thank you.” It’s just a funny thing. I don’t necessarily feel like I have been very disadvantaged as a woman in tech but I am aware of the fact that I am held to a higher standard. A couple of years ago, Lauren and I were chosen to work on a project and someone said, “Oh, well, you’re lucky you got chosen because you are women.” Are you kidding me? We got chosen despite the fact we are women. Q: Do you have any woman role models? How have they inspired you? A: Well, I would say Lauren Bennett and Lauren Scott Griffin are definitely role models. They taught me spatial statistics and also they are just really brilliant. Lauren Bennett started managing the Spatial Stats team while getting her PhD and having a baby all by the age of 30. It’s very inspiring to see the amount of work someone can do. Lauren Scott Griffin is just such an amazing and patient teacher. I really admire and look up to her. But these two would be my role models regardless, it’s not like I have some other male role models that I look up to more. They just happen to be women and they just happen to be the best. Q: What are you driven by? A: I’m very career driven, I want to love what I do for work because that is where I’m going to spend most of my time. It’s really important to me that I love my job, and in order for that to happen I have to work really hard. I’m also a very curious person, almost to my detriment. I can get very obsessed with details. I will spend countless hours learning about minute details of whatever it is that I am working on. I have a very focused personality where I get attached to things and I’m driven by the unattainable pursuit of perfection. It may be my greatest flaw but it does get a lot out of me. I’m driven by wanting to love my life and learn things as I go along. A: Very broadly, my goal is to just love my career, and I love my career right now. I want to be in a position where I can be learning all of the time, and as long as that is happening I think that I’ll be able to consider my career successful. Of course, I don’t want to stay static, I want to keep growing. I got asked by the people from the census in Kuwait to come out for a week and help them analyze their data. That sort of thing gets me really excited, getting to travel and experience other cultures all while doing the work that I love. It’s really cool to realize that I can actually provide value in those circumstances. I’ll go to these places and it’s me in this room full of older men and I’m this woman in her early 30’s telling them things they don’t know and they are all listening to me and taking notes. It feels empowering. Q: How do you see Geospatial Analytics evolving over the next decade? A: Well, I think the temporal aspect is definitely already starting now. I think pretty soon we won’t have to call it “Space-Time GIS” anymore, it will just be “GIS”. We have so much data and everyone is capturing data all of the time. Like, I just realized that my phone is capturing my steps and I never even asked it to. There is just data about everything everywhere, and “everything everywhere” means at a certain time also. I think the temporal piece is going to be huge. I also think it’s going to become more and more accessible to people who are not GIS professionals. Anyone can create a simple map on the web already but I think that people will be able to do some simple analysis on their own. It won’t be something that is reserved for someone who has a degree in GIS. I also hope that we start bringing spatial thinking into the classroom earlier. I wish I had learned about spatial thinking as a child, our minds are so much better at absorbing and molding to these different ways of thinking. Once we are adults, we lose that elasticity. I hope that we start earlier so in the future we can all think spatially and apply that to our problem solving. Q: Are there any issues close to your heart that you want to bring awareness to? A: Women’s health is something that I care a lot about and that’s part of the reason I started working on the Federal Health team when I joined Esri. I think that women’s health and education is hugely important for everything, in this county and especially in developing countries. When you take care of women, you take care of everybody. That’s very much a spatial problem. Giving women access to education and healthcare so they have power over their own reproductive rights is hugely important to me. 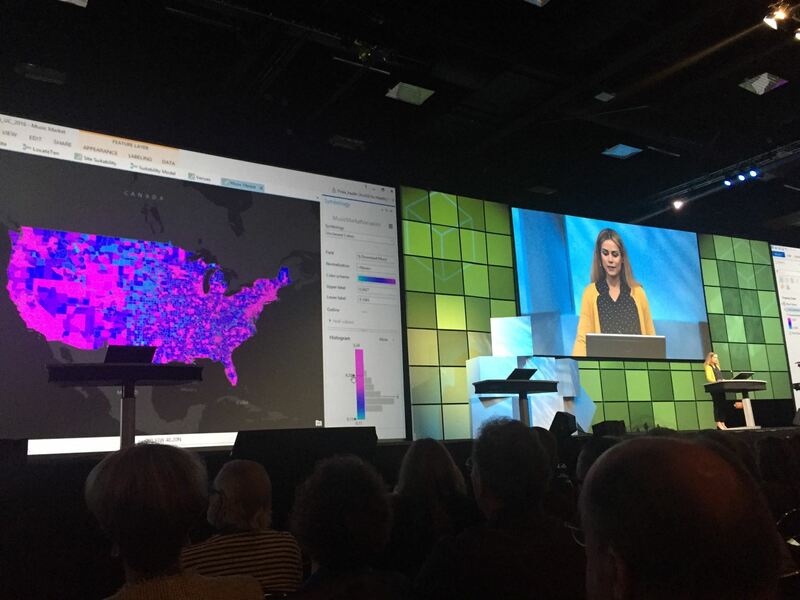 Q: During the 2016 Esri UC session “Spatial Data Mining: Essentials of Cluster Analysis”, Lauren Bennett, discussed the subjectivity of maps and the power we possess as data scientists to tell very different stories. How do you keep your own biases from influencing your work? A: That’s a great question, that’s part of reason why I love spatial statistics, because we do remove some of that subjectivity but we can’t remove all of it. There’s always going to be subjectivity in anything that you do and I don’t necessarily think that’s a bad thing – you just have to be aware of it. So yes, of course, I’m going to have a bias if I’m looking at something that I am passionate about, like we just talked about women’s health and reproductive rights. Yes I do have a bias, I’m coming from a place where I think that is important. However, I am aware of my bias and I want to come as close to getting the truth out of my analysis as possible. This is why we use quantifiable techniques. I also do my best to always play devil’s advocate, especially when I feel passionately about something or when I’m speaking to someone who does. I always ask “What would someone who completely disagrees with you say and what would their argument be?” This way I can at least try to understand where the opposition comes from. If you only talk to people who think like you and only read news sources that agree with you, that’s just confirmation bias, you can get lost and farther from the truth. Q: Do you have any advice for young women in GIS looking to excel in their careers? A: Yeah, speak up! Don’t be afraid to advocate for yourself. I don’t mean that in the “you have to be an extrovert” kind of way because I’m not. I’m very introverted and get told that I’m too quiet all of the time, but I am very firm in my conviction that I deserve what I deserve. I am not afraid to tell someone that I disagree with them or speak up for myself when I feel like I’m not being valued appropriately or included in the right way. Even just in getting hired, they say that most women don’t negotiate their salary. Why wouldn’t you? Ask for more, act like you deserve it. Act like you’re the best and then be the best. Don’t let people walk all over you. You can be shy but you need to be strong. You have to be your own advocate. When we do our annual performance reviews, we have to write what we’ve done over the past year. It feels like I’m not being very modest when I speak up about the great things I have done. I think we are trained to be modest but modesty is really not going to serve you. Of course, don’t be arrogant but definitely don’t be modest. A: I love music, I go to a lot of shows. You saw my plenary presentation, I managed to talk about music for every analysis! I also love travelling, I try to travel as often as I can and see different parts of the world. I travel alone a lot which is great because I’m free to do whatever I want and I always end up meeting amazing people. One of my favorite things to do is read in public. I love just taking a book to a bar and reading by myself. I’ll talk to people if they are interesting or just say “Sorry, I’m kind of busy reading my book!” I also really love learning new things. For example, a couple of years ago I became obsessed with learning how to solve the Rubik’s Cube. I’d love to find a chess club to join in Los Angeles. So yeah, I’d say music, travel, yoga and learning. A: That’s a hard one! The book I’ve probably read the most times is The Giver, it’s the first book that I fell in love with. It made me want to read for fun, not just because I was forced to at school. Another favorite fiction piece is Still Life With Woodpecker by Tom Robbins. I read Daniel Quinn’s Ishmaelwhen I was an undergrad, that book really changed my way of thinking and also blew my mind a little bit. Oh, and Surely You’re Joking, Mr. Feynman! is another of my all time favorites. Right now I’m reading a book called Cosmic Trigger which is this crazy psychedelic thing written in the early 70’s. It’s very “conspiracy theory” and “illuminati”. I don’t believe in any of that but it’s really cool to see how people think in these alternate realities. A non-fiction book that I really loved was Jill Bolte Taylor’s Stroke of Insight. It was really amazing to understand how the brain and your sense of connectivity to the world and to yourself all work together. It’s a physical thing and not all at the same time. Q: You’re a big music fan, what are you currently listening to? A: I’ve been on kind-of an old school hip hop kick. I’ve been listening to a lot of A Tribe Called Quest and DJ Shadow. When people ask me “what kind of music do you like?” I know it’s an obnoxious answer but I usually just say “good music.” I love most kinds of music from jam bands, like Phish, to hip hop to electronic. There is a lot of E.D.M. happening right now in L.A. which can be fun. I also love jazz, funk and blues. I went to Jazz Fest in New Orleans last April. It was really refreshing to see some organic music for a change and actually see people playing their instruments. Not that there is anything wrong with electronic or produced stuff! I love it all. Interview conducted by volunteer Kelsey Kaszas of Epic Land Solutions, Inc.